What is the kayak good for? This is a sit-on-top hard kayak which is particularly interesting. 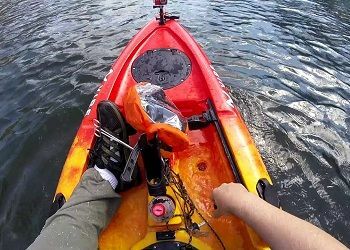 Choosing the right fishing kayak can be challenging. This is especially true if you're a first time buyer. Don't worry, in this article we'll help you determine if the Vibe Yellowfin is the right kayak for you. We'll review the features that that make it a good recreational kayak as well as a fishing kayak. We'll start with a quick overview of the Vibe Yellowfin 100 Kayak Angler Package. Then, we'll take a look at the most important features and try to help you determine whether this is the unit you’ve been looking for. The Yellowfin is a great fishing kayak, that can easily serve as a recreational kayak as well. 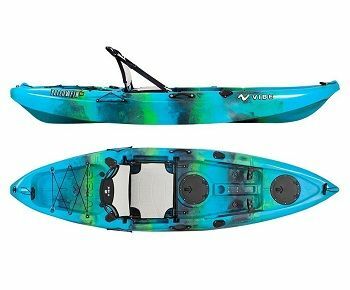 If you need a smaller kayak that has great storage and stability, this may be the yak for you. There are many fishing specific features we'll cover. Some anglers have even learned how to stand up and sight fish from the Yellowfin. This takes a bit of getting used to, but many anglers report that with some practice it's doable. The unit is 10 feet long and 32 inches wide. The unit is 10 feet long and 32 inches wide. This is a good combination for kayaks less than 12 feet long. 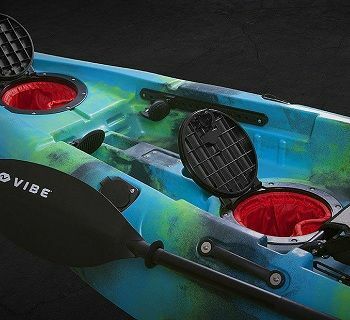 With this in mind, it is safe to say that both portability and comfort have managed to come together in the Vibe Yellowfin 100 Kayak Angler Package. This is a short unit. 10 feet is not a serious length. This means that the unit is not going to be as fast as you might want it to be. However, if you are an experienced angler, you already know that this is not as definitive and necessary. 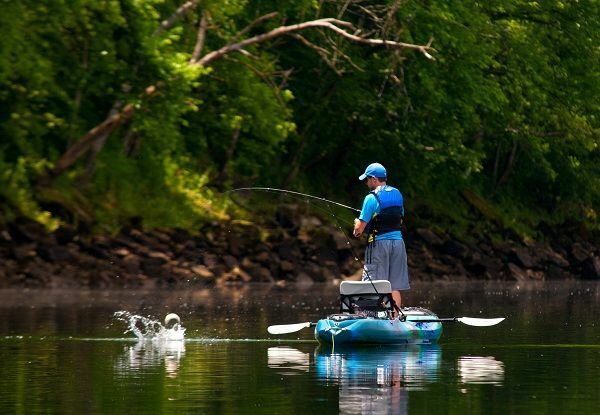 The more important thing when it comes to kayak fishing is for the kayak to be maneuverable so you can quickly react to different situations. Well, the short length is the perfect solution for this. The unit is incredibly easy to maneuver and it is great in the hands of a beginner as well. The width is also important. In case you are wondering, 32 inches is considered to be a fairly average size. A lot of people fail to account for the importance of the width. It is the main thing which is going to determine how stable the unit is when you onboard and load it with equipment and when you start paddling in the lake. At 32 inches, there's alot of stabilty. Many anglers are able to stand on this kayak and sight fish from it. It's recommended that users take precautions like adding foam floats to their fishing rods. If you were to flip the kayak, these floats would prevent your rods from sinking to the bottom. You may want to think about similar precautions for the rest of your gear. The Yellowfin 100 comes with a Journey paddle. It also has adjustable foot braces. The foot braces help you push on the boat with your legs and paddle more effectively. This helps you achieve your top speed while paddling. The hull constructed of rotomolded polyethylene. This is the standard process for building plastic kayaks. Plastic beads get poured into a hot mold that rotates for even distribution. ​There are 6 scupper holes with the plugs included. Removing the scupper holes helps you drain the kayak of any water that may accumulate. The kayak also comes with 4 carrying handles. 2 on the sides and 1 on the bow and stern. Now, while the hard construction is going to provide you with some serious performance capabilities on the water, getting there is a bit more challenging. You have to account for specialized kayak holders which are necessary to transport the unit from your place to the water. In addition, this is a 10 feet unit, which means that you have to find a convenient place to store it. You don't want to leave it out in the sun as UV light may degrade the hull. At the very least, you want to use a cover for protection. The kayak comes with 2 hatches that are 9 inches in diameter. The hatches also have fabric bag inserts so you can store small objects that you want to access quickly. The weight capacity is 375 lbs. which is very respectable for a yak of this size. It weighs 57 lbs. At this weight many users are able to car-top the Yellowfin. In terms of comfort, the unit comes with adjustable foot braces, Vibe Hero seat for enhanced sensation while paddling, as well as built-in cup holder to secure your beverage while cruising. The gear mounting capabilities are also pretty substantial when it comes to it – you can rely on 4 capped flush mount fishing rod holders and also Vibe mount accessories mounting point. All in all, this is a great unit for those of you who want to enjoy kayak fishing. It might also be appropriate for certain recreational activities because as per definition, this is the purpose of the unit. It is well worth the investment and it will provide you with everything you may need.